Start Date: This program designed to be Start Anytime. Students may attend any of the moduled classes as they see fit, including taking some modules more than once. Prerequisites: Completion of Foundation Skills at When Hounds Fly. We regret that we no longer accept students from other schools, even if they are clicker trained. Please note: This class is not appropriate if your dog exhibits excessive fearful or aggressive behaviour. Please see our Behaviour Modification page for information on private lessons to address fear or aggression. This is an advanced class. While we do start easy and progressively get harder over the five weeks of the course, your dog should come in with a good grasp of the behaviours that were covered in Foundation Skills. The classroom is a very supportive environment, and we will all be encouraging and supportive, regardless of your dog’s skill level; however, if your dog cannot manage Foundation behaviours, you will not get the most out of this class, and it will also hold the other students back. Practice before our session starts so we can dive right in! When Hounds Fly’s Canine Good Neighbour (CGN) Preparatory Class has been wildly successful over the last four+ years. Many graduates of this program have gone on to earn their Canine Good Neighbour titles and become certified Therapy Dogs. This four module course is designed to familiarize you with the twelve exercises a dog must perform at a CGN examination to get their CGN title, and give you the training plans needed for you and your dog to ace the exam. Students completing this class are not required to book an examination, but are strongly encouraged to do so! The CGN Test is an evaluation that is designed to reward responsible dog owners with well-mannered dogs with a title and certificate from the Canadian Kennel Club. The CGN test helps promote responsible pet ownership and tests their ability to behave amongst people and other dogs in the public. All dogs, regardless of breed or pedigree (mixed dogs are welcome!) over the age of 6 months are welcome to take the exam. Additionally, the exercises in CGN are similar to those required for therapy dog work, so passing this exam is great start to many other titles and certifications to follow. Start on 1,2, or 3 (any order). Try to make the Mock Exam a later or your final course to test your Stay, Leash Walking, and Recall skills. 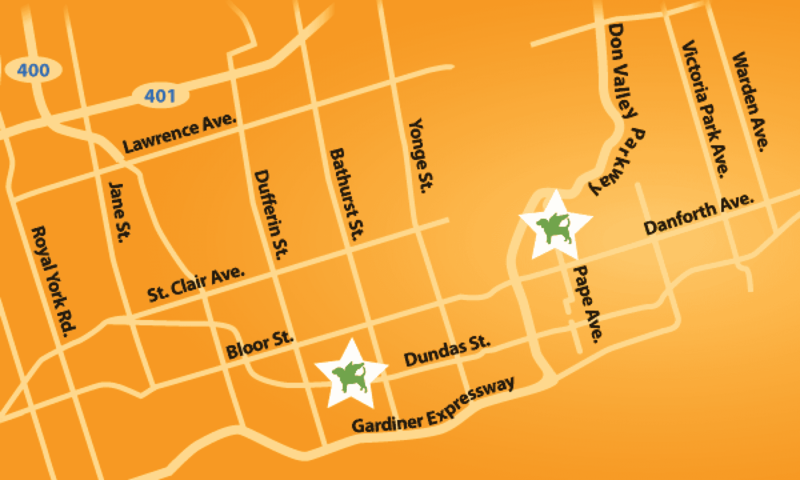 To get started, login to your Dundas West or Pape Village calendar and buy the program in our online credit shop. If your login was deleted, please email the office at info@whenhoundsfly.com and we will re-setup your account.